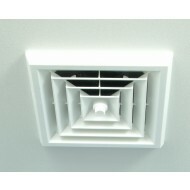 Our Ceiling Vent features an 6" register boot and 12" white square ceiling grille. These can be used for new or retrofit installs. 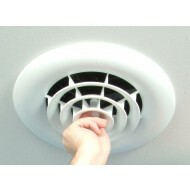 Our Ceiling Vent features an 6" register boot and 12" white round ceiling grille. These can be used for new or retrofit installs. 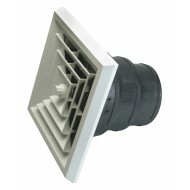 Our Ceiling Vent features an 8" register boot and 12" white round ceiling diffuser. These can be used for new or retrofit installs. The ceiling diffuser attaches to the boot with a patented knob so the diffuser can be simply removed for cleaning or painting the ceiling. Made in USA.The diffusers are constructed from a high impact ABS and are paintable to match any decor. Custom color and custom graphic diffusers will be available soon. 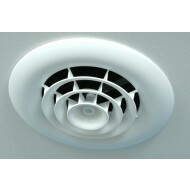 Our Ceiling Vent features an 8"-7"-6" reducing boot and 12" white round ceiling grille. These can be used for new or retrofit installs. The RetroFit Kit features a galvanized metal ring, 12" Square White Ceiling Diffuser and a 4 pack of screws with anchors. Now you can easily replace your old, chipped or rusted metal diffusers with this easy to attach magnetic diffuser. The RetroFit Kit can cover round ceiling diffuser openings up to 8"
The Square Diffuser can also be used to cover a 10"x10' flush bath fan opening. The RetroFit Kit features a galvanized metal ring, 12" Round White Ceiling Diffuser and a 4 pack of screws with anchors. Now you can easily replace your old, chipped or rusted metal diffusers with this easy to attach magnetic diffuser. 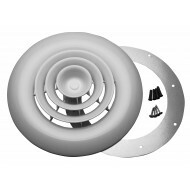 The RetroFit Kit can cover round ceiling diffuser openings up to 8"
Our Ceiling Vent features an 6" register boot and 12" white square ceiling grille with rotary damper all in one. These can be used for new or retrofit installs. The ceiling diffuser attaches to the boot with a patented knob so just the grille can be simply removed for cleaning or painting the ceiling. These are Made in the USA of a high impact plastic that won't dent or rust. The diffusers are paintable to match any decor. Custom color and custom graphic diffusers will be available soon. Our diffusers come with their own register boot all in one. The register boots are available in 6", 8" and a reducing boot 8"-7"-6" sizes. Ceiling Vent features an 6" register boot and 12" white round ceiling grille with an installed rotary damper. The register boot easily attaches to your flex duct run with the included 36" cable tie or UL181 Classified tape.The register boot attaches to the ceiling no matter what the thickness with the included Quick Zips. These are Made in the USA of a high impact plastic that won't dent, fade, chip or rust. 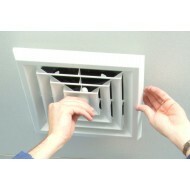 These vent covers won't condensate like metal and are popular in high humidity and coastal region applications. 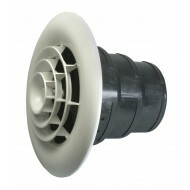 This easy attach knob also makes just the diffuser cover simple to remove for cleaning or painting the ceiling. 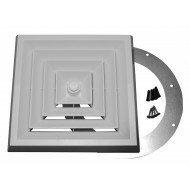 Our Ceiling Vent features an 8" register boot and 12" white square ceiling grille with butterfly damper all in one. These can be used for new or retrofit installs.